I never thought I'd be one to make my own Enchilada sauce, but necessity is the mother of invention. 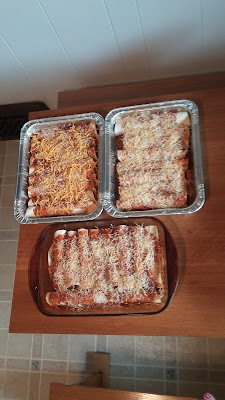 I tinkered with a few recipes last month when we were snowed in and I was craving enchiladas. I am sure it isn't super authentic, but my family LOVES it, and it goes great with my Freezer Chicken Enchiladas. Heat the oil in a large saucepan over medium heat. Add the garlic and saute for 1 to 2 minutes. Add the onion, oregano, chili powder, basil, ground black pepper, salt, cumin, parsley, salsa and tomato sauce. Mix together and then stir in the broth. Bring to a boil, reduce heat to low and simmer for 30 to 45 minutes. Sidenote: I read if you simmer longer, the flavor is even better, but I haven't had the patience to wait yet. because why make one when you can make three?